When should Rudduck Mega-Lyte be administered? Mega-Lyte should be administered when any signs of calf scouring are apparent. The scour can be white, yellow, grey or blood-stained and is often foul-smelling. Although more common in hand-reared calves, it can also occur in calves which are suckling their mothers. How do I administer Rudduck Mega-Lyte? 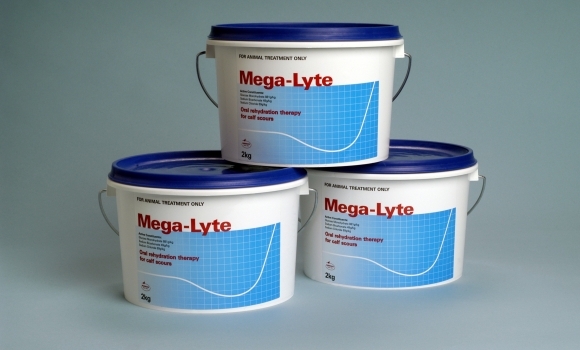 To prepare Mega-Lyte solution, dissolve 100g in two litres of warm water, i.e. 35’C, (scoop inside: 1 scoop contains 65g of Mega-Lyte). Calves to be fed 2L of ‘Mega-Lyte solution’ morning and night for two days. Following this, calves should be administered alternating rations of Mega-Lyte and regular feed for a further two days. Normal feeding may then resume.